Finding the quintessential place setting for your reception dinner can be tricky for even the most seasoned decorators. Whether you are a bride or an experienced planner, find all of the tablescape inspiration you need from real wedding receptions. 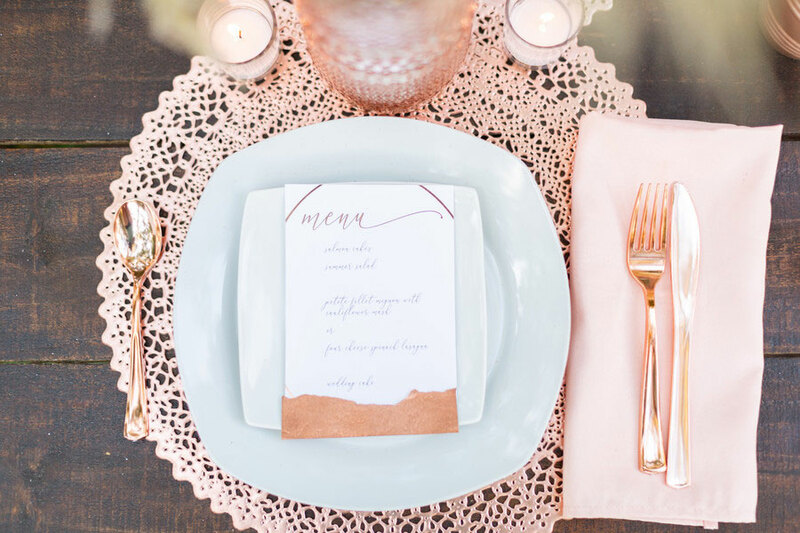 A millennial bride’s dream place setting – rose gold meets blush. Gilded flatware and horse figurines lend touches of splendor and whimsy. Delicate flowers adorn fine plates, popping against a wood table. Elevate your dishware, literally. For a rustic, woodsy-themed affair use blocks of wood as place mats. For some festive flare, place cranberry-hued napkins next to green garland and gold plates. Keep things clean and simple with all-white tablecloth, plates, and napkins. Add something cute and surprising for your guests, like these napkins folded around menus to mirror the groomsmen's tuxes. Gold-edged glass plates styled with evergreen sprigs pop against a textured table cloth. Wrap a cream colored napkin around a silver plate for a classic, elegant look. Add levels to your décor with non-circular plates. The scalloped edges of these plates add an elegant detail to a simple silver place setting. From pink florals to blush tablecloths, seat your guests in a rosy wonderland. Opt for a Tiffany blue hue plate and copper cutlery for an elevated, modern-meets-vintage feel. Textured linens were topped with gold chargers, die-cut menus, and each guest’s laser-cut name. Beige dupioni linens and gold bedazzled chargers add some dramatic elegance to the table. Have your charger match the greens on your table for a fun effect. Give the royal hue a go with rich napkins atop gold plates. A white plate stands soft against a powder blue charger, creating a calming, oceanic effect. Give your guests the Cinderella treatment with glass plates. Glass accents look great against exposed wood. For a tropical take on the big day, place some fruit on the napkin. Reach for classic fine china for a sophisticated-yet-simple place setting. Gold-rimmed glasses and cutlery complement cranberry napkins. A patterned, blue china plate pops against a white charger and gold silverware. Why settle for silver when you can have an all-gold setting?